SGT Goes to the Movies Part 3 — The Cold, Hard Facts of what is really Simple, Good and Tasty. This is part 3 in a series about running a craft services table for a film shoot here in Minneapolis for the Independent movie, Stay Then Go. Read part 1 here. It is 4:30 a.m. on the first day of the shoot. I scramble around in the dark, my head-lantern on, as I try to set up a buffet table. Electricity is sent my way by way of a "stinger," but it's not enough juice to run a large, buffet-style coffee-pot, a smaller hot-water pot, and two toasters. I have to make a choice. I unplug the toasters. Fortunately, the Bison Sausage Bread and Peanut Butter from Hell's Kitchen is a hit despite the fact that the bread cannot be toasted. Coffee is the first order of the day, the most important thing to provide. Again, we're fortunate. It's Peace Coffee and it's good. Really good. At once full-flavored, but mild -- without the acidic after-effect that can turn a stomach sour. Later on, I will turn it into iced coffee for one of the treats of the day. Breakfast sandwiches, procured by one of the few "24-hour" meal vendors (and a national chain that will remain nameless) sit on the side of the table. I would say that they are cooling, but they are not. They were never warm. And they're certainly inedible. I've made some scrambled eggs and potatoes as a side dish for vegetarians and those who want to be "gluten-free." This turns into a blessing as they are eaten up instead of the sandwiches. Others make bagels with organic cream cheese as well as Tofutti procured through a gift card from the Seward Co-op. Hot, slow-cooked Hell's Kitchen oatmeal is passed over for other, cooler options as the morning already feels warm and the crew is hot and sweaty with labor -- long before the sun comes up. Thus begins the first hour of what will become a 20-hour day. Gorkha Palace PakorasIn the afternoon, as temperatures feel well beyond the 87 degree predicted high, a platter of marvelous vegetable pakoras from Gorkha Palace go quickly. 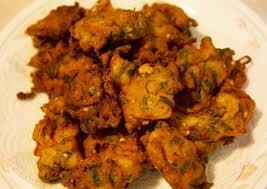 Pakoras are deep-fried fritters -- of vegetables, fish, chicken, even bread -- found across South Asia. They are a kind of perfect food -- at once crunchy, chewy and spicey. Most crew members prefer the slightly sweet tamarind sauce that is served as a dipping sauce as opposed to the mint chutney that's also provided, but both have their devotees. The heat of jalapenos in the batter catches a few by surprise. But the platter, weighing about 5 lbs., goes in less than an hour. Thus is the reality of the "Craft Service Table." On a location set of a small independent feature, an infinite number of things can go wrong. You are basically turning "real world" locations into your stage, and often those stages are not designed to be filmed. They're designed for their own explicit purposes with nary a thought as to how easily they may be lit or mic'd. Air-conditioning is run only intermittently under the hot lights. You're not at a Hollywood soundstage. 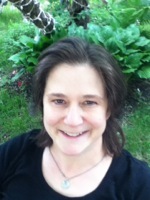 You do not have a giant, dream factory of sets and infrastructure in a climate-controlled environment. Variables such as heat and electricity must be adapted to. In this environment the exercise of running the craft services table becomes about two things: water and ice. 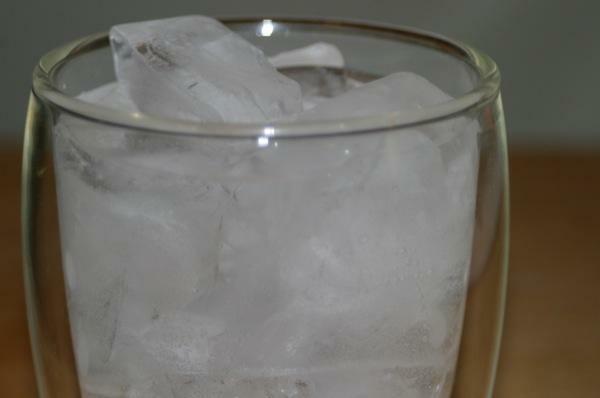 What is simple, good and tasty is just that simple: water and ice. It doesn't really get simpler than that. Fortunately, La Croix has provided a remarkable donation of over 2,700 cans of sparkling water. If only the ice were donated, too. In the first two-days of the shoot, we spend over $80 in bags of ice. Ice to cool food. Ice to cool water and soda. Ice to cool ice. By the end of the day I realize that my job is not much more than a warehouse position, continuously lifting case upon case of La Croix and plain bottled water, and bag upon bag of ice. It is back-breaking. By the time the 20th hour arrives, I am delirious with lack of sleep and exhaustion. And that, as they say on set...is "living the dream."